For an overview of our programs, including information on ages and schedules, please click here. Our Open Houses focus on answering all of your questions about the program, philosophy and application process. You will also take a tour of the school and see the classes while in session. Application packages can be obtained both during the Open Houses and the tours, or by stopping by the preschool office at 115 Park Ave. You may also download the general application here. ​Come see our school in action and get all of your questions answered at one of our Open Houses!! Please RSVP to ushpreschool@gmail.com. Our first Open House for the 2019-2020 school year will be on November 18, 2018 at 10am. During the Open House you will tour the school and attend a presentation by the director where you will be able to ask questions about our program, philosophy and the application process. Applications for new students are due January 31st, 2019. Applications received later than that will be admitted as space allows. If you apply by the January 31st deadline, you will be notified March 1st regarding your acceptance. We have rolling admissions after February. Falling into one or more of these categories is not a guarantee of admission to the school, or a guarantee of a space in a particular class. 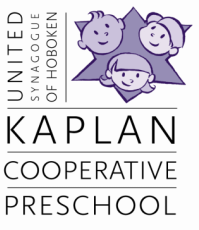 What is the age cutoff for children to attend Kaplan Cooperative Preschool? To enter the 2.5, 3 or 4’s program, applicants must have reached that age no later than September 30th. What if my child is born in the Spring or Summer? We added a class called Parparim (butterflies in Hebrew) for April, May, June and July birthdays that begins in either November or January depending on the pool of children each year. Applications for this program are accepted at the same time as the students who begin in September (January 31st). What is the Gan Katan Program? We also have a two-hour drop off class for 2 year olds offered Monday through Thursday from 9-11am or Monday, Wednesday and Fridays 10:30-12:30pm. This is a rolling admissions class where you can join as your child turns 2, if space allows. To apply for September 2018, please use the general 2018-2019 school application. assignment is offered at the school’s discretion. The admissions committee works to create educationally balanced classrooms that enable us to include as many children as possible. Does my child have to be toilet trained? No, we do not require it. What are my tuition payment options? Please click here to view payment plan options. The Kaplan Preschool admits students of any race, color, national and ethnic origin to all the rights, privileges, programs, and activities generally accorded or made available to students at the school. It does not discriminate on the basis of race, color, national, sexual orientation, disability and ethnic origin in administration of its educational policies, admissions policies, scholarship and loan programs, and athletic and other school-administered programs.